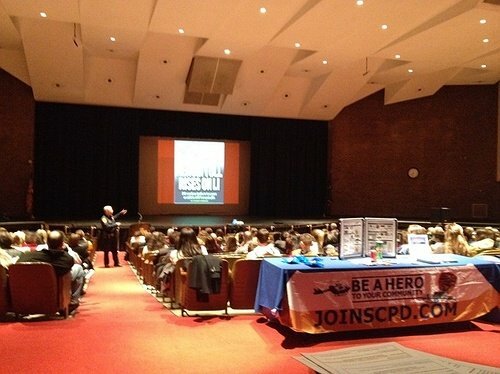 Shoreham, NY - March 12, 2015 - On March 2, 2015, Legislator Sarah Anker attended the drug awareness forum, “Drugs in Our Town: The Ugly Truth” at Shoreham-Wading River High School. The forum was presented by the Suffolk County Police Department in conjunction with their Operation Medicine Cabinet program, which enables county residents to drop off unwanted or expired medications at secure locations within the county’s seven police precincts. The goal of Operation Medicine Cabinet is to curb abuse of prescription drugs and to deter exploration of harder street drugs such as heroin. “I want to thank the Suffolk County Police Department and the Shoreham-Wading River School District for facilitating this phenomenal event,” said Legislator Anker. Forum attendees heard from the Suffolk County Police Department Response Bureau about drug awareness, with a particular focus on heroin and opioids, and received information from the Suffolk County Medical Examiner’s office regarding their forensic programs. Subject: LongIsland.com - Your Name sent you Article details of "Legislator Anker Attends Drug Awareness Forum at Shoreham-Wading River High School"